Welcome to the PIRG Site! of Warsaw University of Technology (WUT). Today, on Polish Public Radio Programme 3 during "Welcome to Three" show section on electric buses that would be developed and manufactured in Poland as well as on possibilities of developing Polish battery technology. As a commentator on the topic Leszek Niedzicki, PhD, Eng. of our team has been featured. The aforementioned part of the show can be played here. Piotr Jankowski, MSc, Eng., PhD Student from our group working with ERI ALISTORE under supervision of Prof. Władysław Wieczorek, PhD, DSc and Prof. Patrik Johansson (Chalmers University of Technology, Sweden) has today defended his PhD thesis and got his PhD title. Thesis is entitled Computational and experimental studies on SEI-forming electrolyte additives for lithium-ion batteries. Congratulations! Today, on Polish Public Radio Programme 4 during "Some Optimism in the Afternoon" show section on Formula E and changes to cars from the fifth season was played. As an expert on lithium-ion batteries Leszek Niedzicki, PhD, Eng. of our team has been featured. The aforementioned part of the show can be played here. Today, on Polish Public Radio Programme 3 during "Welcome to Three" show section on electric cars and their advantages over traditional cars was played. Member of our Group was interviewed for this programme as an expert - Leszek Niedzicki, PhD, Eng. Show excerpt can be played here. First channel of the Polish Public TV (TVP1) today has shown new episode of the popular science "Jak to działa" ("How it works") programme focused on fire. As an expert on chemistry Leszek Niedzicki, PhD, Eng. of our team has been featured. The excerpt from the episode with dr Niedzicki can be watched here. Today in the polish Ministry of Energy took place the signature of the founding agreement of the PolStorEn - Polish Consortium of the Electrochemical Energy Storage. Consortium is a result of the consolidation of this scientific branch in Poland, country's authorities as well as battery industry in the face of electromobility challanges. The founders of the consortium are: Warsaw University of Technology (Leader of the Consortium), AGH University of Science and Technology, Institute of Non Ferrous Metals in Poznan, Gdansk University of Technology, Poznan University of Technology, Jagiellonian University in Krakow and University of Warsaw. The main aim of the establishment of this scientific-industrial consortium is development and application of innovative solutions from the energy storage field, mainly by employing polish intelectual potential and economic potential. The formula of the Consortium assumes involvement of scientific institutions, investment funds and industrial partners in the field interested in the final development and application of newly developed technologies. PolStorEn consortium is the essential component of the freshly forming in Poland whole value chain aiming at manufacturing of novel cells (e.g. lithium-ion) and supercapacitors. It will act as a bridge between science and economy. It will allow to unleash the polish science potential, so the achievements of polish scientists could serve economic and social development of the country even better and more efficiently (partners of the consortium jointly have 56 identified solutions and product technologies, protected with 31 patents and 29 patent applications both polish and foreign ones). It perfectly fits the polish government efforts and initiatives on both national and european level. In the signing of the founding agreement took part representatives of Ministry of Energy, Ministry of Enterpreneurship and Technology, as well as representatives of polish industry. The plan to form this consortium was announced in Brussels week ago by viceminister Kurtyka (movie). Faculty of Chemistry of the Warsaw University of Technology is a leader of PolStorEn and the PIRG group is a core of the lithium-ion technology-related works at our faculty. 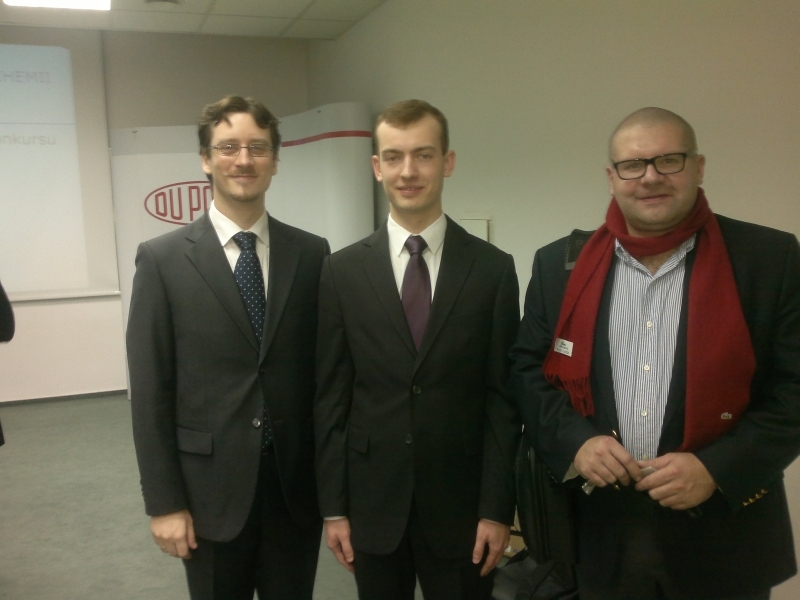 Today the PhD thesis defense has taken place in our group - Piotr Wieczorek, PhD student of Marek Marcinek, PhD, DSc, Eng. has been granted his PhD, Eng. title. PhD thesis was entitled Application of MPCVD method to manufacturing of Si/C composite electrodes compatible with electrolytes based on imidazole salts. Today, on Polish Public Radio Programme 3 during "Welcome to Three" show section on flow cells and other energy storage technolgoies was played. Member of our Group was interviewed for this programme as an expert - Leszek Niedzicki, PhD, Eng. Show excerpt can be played here. PhD Student from our group, Anna Bitner-Michalska (PhD student of Marek Marcinek, PhD, DSc, Eng.) has obtained her PhD title today during thesis defence connected with Faculty Board session. PhD thesis was entitled Studies on optimization of imidazolate sodium salts based electrolytes for sodium-ion battery applications. PhD Student from our group, Anna Łatoszyńska, supervised jointly by prof. Wieczorek and prof. Kulesza (from Chemical Faculty, University of Warsaw), has defended her PhD thesis today. PhD thesis was entitled Nonaqueous proton conducting electrolytes and their application in supercapacitors. 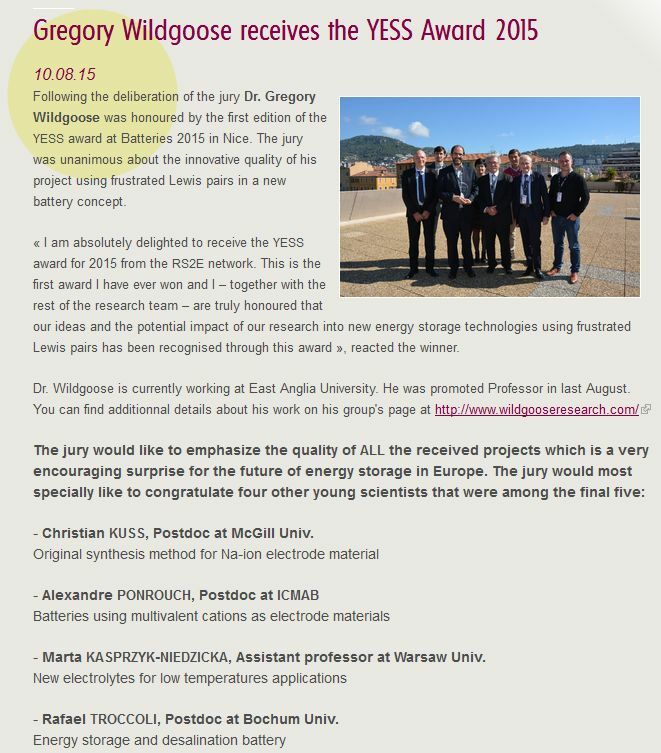 Member of our Group, Marta Kasprzyk PhD, Eng., has become a finalist of the YESS Award 2015 (Young Energy Storage Scientist). Official information was published on the site of RS2E, french organization that hosted this pan-european (in fact world) award competition (screen is available here). Congratulations! A new short clip is available, that explains our group's input to the European SirBatt project: link to the movie. PhD Student of prof. Wieczorek, Marta Kasprzyk, has been given today PhD title after thesis defense connected with Faculty Board session. PhD thesis was entitled New lithium liquid and gel electrolytes containing amorphous mixtures of ethylene carbonate and poly(ethylene glycol)s.
Today, on TVN channel, in "Good Morning TVN" programme, in section devoted to electric vehicles, our team member, Leszek Niedzicki, PhD, DSc, appeared as an expert on lithium-ion batteries. Today, Marta Kasprzyk, MSc, Eng, a PhD Student from our group, started 3-years research project Preludium financed by National Science Center. Project title is New amorphous solvent mixtures and electrolytes for lithium-ion cells. Project is signed under UMO-2013/09/N/ST5/00875 agreement. Today at 21:30, on Tok FM polish radio a talk with Leszek Niedzicki, PhD, Eng, member of PIRG group, has been aired. Talk covered batteries, concepts and future. Whole programme (Radio Science Academy) can be listened here (polish language). On the TVP1 channel (Polish public TV) there has been broadcasted the newest episode of the "Jak To Działa" ("How It Works") show devoted to the water. In the "volatile/explosive" section member of our group, Leszek Niedzicki, PhD, taken part as an expert on the lithium and sodium metals chemistry - tv footage (explicit). 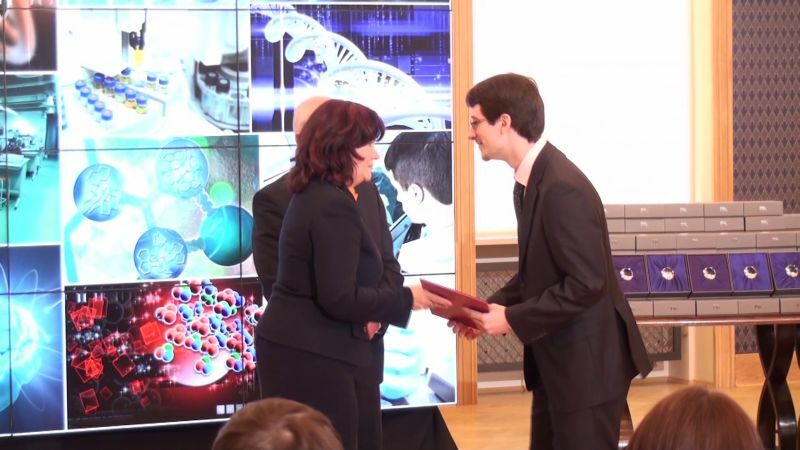 Diploma student of PIRG, Tomasz Trzeciak, Eng, has been given a prestigeous scientific grant Ventures, awarded by Foundation for Polish Science. The grant will cover his Master of Science thesis research for synthesis and investigation of new lithium salt for lithium-ion cells electrolyte. Marek Marcinek, member of our team, has been honored today with the scientific degree of Doctor of Science after successful passing of habilitation colloquium. Congratulations! Bloomberg Businessweek Polish Edition featured report on lithium-ion batteries, in which Leszek Niedzicki, PhD (PIRG member) has been cited as an expert in the field. Part of the article on Bloomberg Businessweek Polska site. 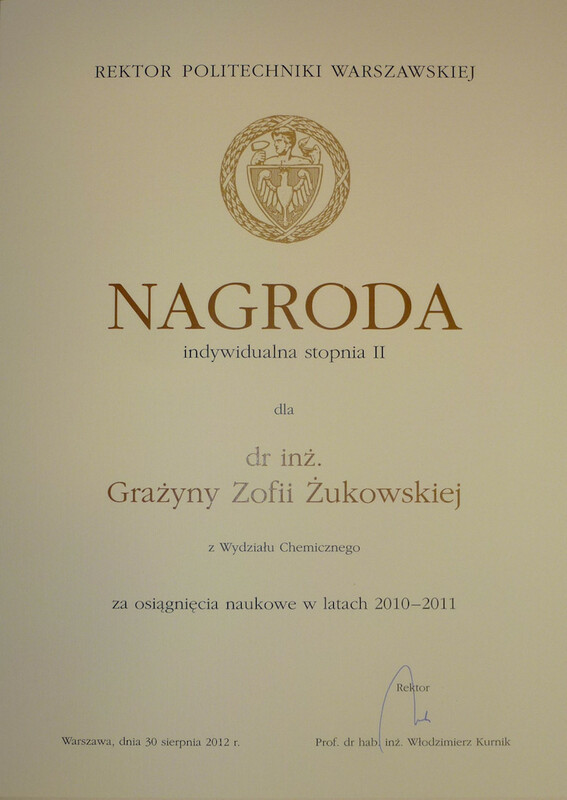 Chancellery of the Prime Minister of Poland held the Prime Minister of Poland Science Awards ceremony. 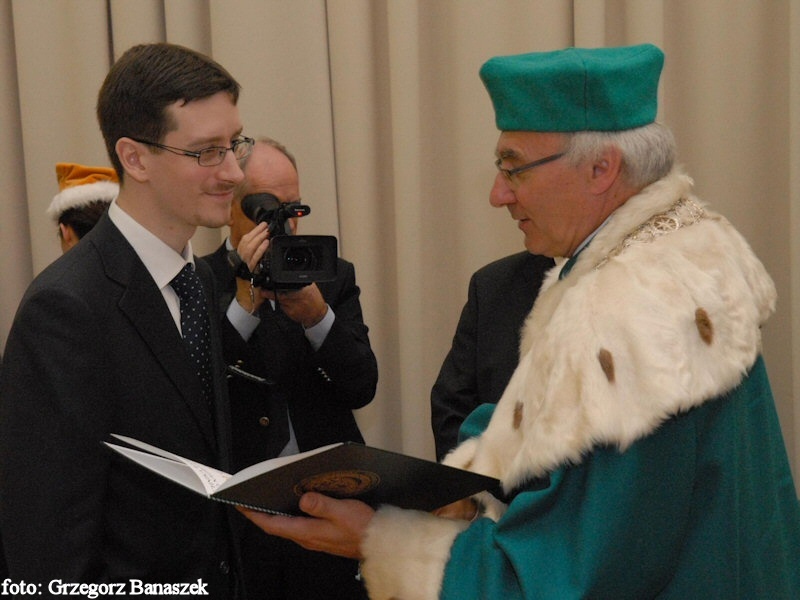 Leszek Niedzicki, PhD, of the PIRG group, has been awarded with Science Award for the Best PhD thesis. 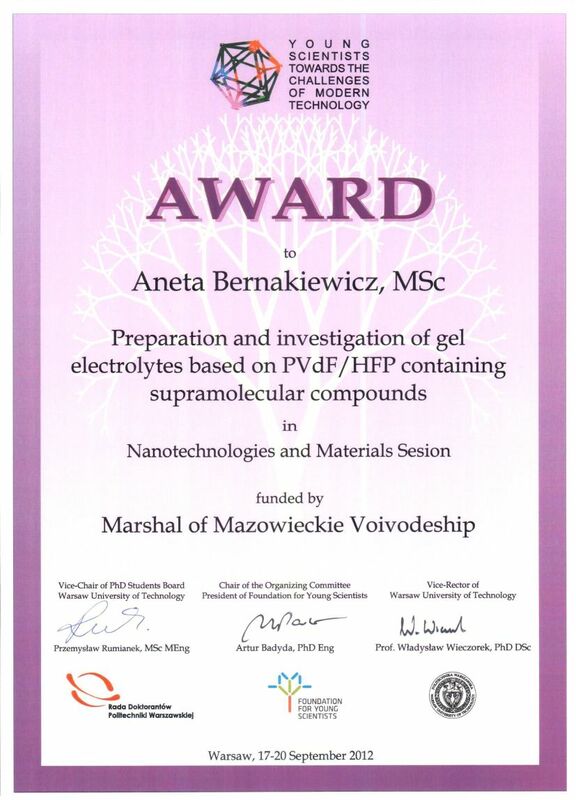 Prof. Barbara Kudrycka, Polish Minister of Science and Higher Education presented the award. Ceremony Photo. In Polish public TV on the first channel (TVP1) "Jak to działa" ("How It Works") programme has been broadcast. This instalment of the series was devoted to energy storage. In a part about batteries and cells, our team member, Leszek Niedzicki, PhD, participated as an expert, speaking about LiTDI salt success, too - tv footage (explicit). Inaugural lecture at the Faculty of Chemistry (Warsaw University of Technology) academic year inauguration was delivered by group member, Marek Marcinek, PhD. Three of PIRG group members were awarded University's President Prizes at the academic year inauguration on the Faculty of Chemistry of the Warsaw University of Technology. Zofia Grazyna Zukowska, PhD and Marek Marcinek, PhD, have been awarded the team prize. Leszek Niedzicki has been awarded the individual prize for his PhD thesis. As a teaser to the Warsaw University of Technology promotional event "Electric Cars - Vehicles of future?" on Polish TV Polsat "Nowy Dzień" programme, the following employees of the WUT were featured: Leszek Niedzicki, PhD, of the Faculty of Chemistry and Wiktor Niedzicki, MSc, of the Mechatronics Faculty - tv footage. As a teaser to the Warsaw University of Technology promotional event "Electric Cars - Vehicles of future?" on Polish Public TV "Kawa czy Herbata" programme, the following employees of the WUT were featured: Leszek Niedzicki, PhD, of the Faculty of Chemistry, Arkadiusz Hajduga, PhD, of the Faculty of Automotive and Construction Machinery Engineering and Wiktor Niedzicki, MSc, of the Mechatronics Faculty - tv footage. One of the Wieczorek's Team (a.k.a. PIRG) member - Leszek Niedzicki, PhD - received the most prestigous award for engineers in Poland - The Siemens Award for the best PhD Thesis that had industrial application. During the ceremony at Warsaw University of Technology the award was handed by the WUT President, Prof. Włodzimierz Kurnik, PhD, DSc, and the President of the Siemens Poland Ltd., Mr. Peter Baudrexl. Ceremony Photo.